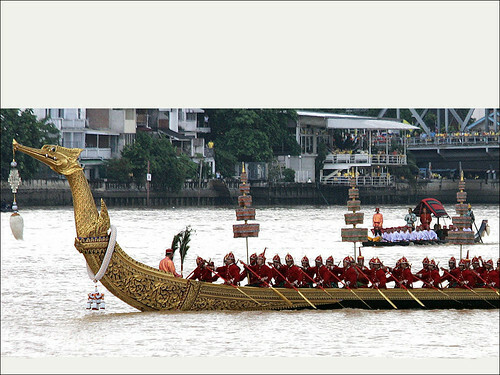 If you’re in Bangkok right now, you have a great chance to see one of Thailand’s most spectacular events: the Royal Barges Procession. And don’t worry, it’s not something that Thai people have come up with to entertain tourists – in fact, it’s a very old tradition which can be traced back into the 14th century, when Ayutthaya was the centerpiece of the nation and Bangkok didn’t even exist. It’s a long event, but the highlight takes place on Friday, 9. November 2012 between 3pm – 4pm. The main piece is a deeply revered Buddha image, which Thai people call Phra Buddha Sihing and members of the Thai royal family making offerings to the monks at the Wat Arun temple. But as a spectator, what’s most impressive is the procession of 52 traditional barges which move down the Chao Phraya river in a five-columned battle formation, during which the 2200 boatsman sing and chant in unisono with a leading voice. In total this procession is 1280 meters long, and 110 meters wide. 2200 sailors of the Royal Thai Navy are serve as oarsmen. In total the procession takes around 55 minutes to go down all the 4.5 kilometers of their journey from Thonburi bridge to Wat Arun. You can buy tickets online at welovebooking.net for 1500 per person if you want to view the procession from the Royal Thai Navy pavilion. But you can also watch the procession from various public places for free. Guidebook author Kevin Revolinksi recently visited the rehearsal, check out his interesting report with photographs of the rehearsal procession here. 15:00 Hrs: The Royal Barges will be moored at the Vasukri Royal Landing Pier. 15:10 Hrs: His Royal Highness Crown Prince Maha Vajiralongkorn will preside over the Royal Barge Procession and Royal Kathin Ceremony at Wat Arun on behalf of His Majesty the King. The Crown Prince will board the Royal Barge Suphannahong at the Vasukri Royal Landing Pier. 15:40 Hrs: The Royal Barge Procession will pass Royal Thai Navy Convention Hall. 16:00 Hrs: His Royal Highness Crown Prince Maha Vajiralongkorn will present Kathin robes to monks at Wat Arun (Temple of Dawn).